The group of Prof. Richard Hahnloser has published data about how songbirds learn to sing their songs. They have for the first time provided evidence at the neuronal level for a previously postulated model for learning processes. 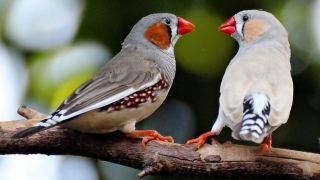 Zebra finches learn to sing and use songs for social communication. Because the vocal learning process in birds has many similarities with speech and language development in humans, the zebra finch provides a useful model to study the neural mechanisms underlying speech and language in humans. Hahnloser and his group use the songbird model system to study how neural circuits process auditory and motor information. The group provides evidence that during vocal learning, sensory auditory information is fed back to the motor neurons that produced the signal – the causal inverse feedback model. Indications for the existence of such a feedback loop have been around for a long time. For instance, the fact that humans can immediately imitate a sound after hearing it only once, points to the existence of such a feedback mechanism. The work by Hahnloser’s group that was reported in the April 22 issue of PNAS, for the first time provides evidence for the existence of this feedback loop at the neuronal level. “The causal inverse model is very interesting because it provides the organism with new skills”, says Hahnloser. “Based on this research we can now look for functional evidence in terms of behavior to see whether the bird actually uses this model for learning.” According to Hahnloser, he and his team have shown once more that the bird brain is highly sophisticated, but that further research will be needed to see to what extent the results are extrapolatable to learning in humans. Evidence for a causal inverse model in an avian cortico-basal ganglia circuit.